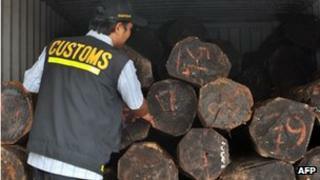 The illegal logging industry is worth almost as much as drug production, according to the international police organisation Interpol. In collaboration with the United Nations, Interpol has launched the Law Enforcement Assistance for Forests project (Leaf), which fights the crime of illegal logging and the trafficking of such timber. Davyth Stewart at Interpol says the value of illegal logging is worth more than $30bn (£19bn) a year, while the legitimate annual global trade is estimated to be $115bn (£72bn). "There are billions of dollars being invested in forest protection around the world and, as a result, organised crime is looking seriously at the timber industry as a way of generating revenue, and also for laundering the proceeds of crime," he says. "That is theft of natural resources from some of the poorest countries in the world," he adds. The private sector is also missing out significantly. "They are losing opportunities to tax that revenue," he says, "They are losing opportunities to auction logging permits." "Most of the profits generated by the timber industry are in the processing, transport and production of timber," says Mr Stewart. He explains how Interpol is looking at the illegal logging industry at the highest level. "We are looking for those that are the kingpins in this timber mafia," he says. "They are processing that timber and laundering those proceeds through foreign banks and tax havens," he maintains. The problem is global, with illegal logging prevalent in the Amazon Basin, the Congo, Borneo and Sumatra, South East Asia, Central America and Russia. "In Indonesia alone, illegal logging is estimated to cost up to $8bn a year," Mr Stewart says. However, global timber markets are moving to eliminate illegal logging. The US has passed amendments to the 2008 Lacey Act to ban the importation of illegal timber, the European Union has timber regulations which will commence in March 2013, while similar legislation is being considered in Australia and New Zealand. Legislation threatens companies with fines if they end up buying and selling wood which has come from illegal logging. But what can a company do when it wants to buy legal timber, but has trouble establishing exactly where the wood has come from? John Simon, chief executive of Simmonds Lumber in Australia, says the company took a decision at board level some years ago that any responsible business should implement a process of due diligence that ensures that any product they purchased comes from a legal source. "We were not prepared to stand in front of our customers and not guarantee that any wood we sold them was produced legally," he says. "Although many of our customers at the moment are not demanding this, it was a decision we took to step ahead of the industry," he says, saying it was a "moral responsibility". Timber that Simmonds Lumber imports ends up as house framing, decking, flooring and in furniture. "Our customer base is timber merchants, retailers, builders, cabinet makers and anyone who deals in timber," Mr Simon says. "Our expectation is that within the next 24 months all importers of timber into Australia will be required to provide some due diligence that ensures legality under the new Illegal Logging Prohibition Bill," he adds. He explains how, when buying from Indonesia, which is notorious for illegal logging, his company obtains a certificate that proves the provenance of the timber. Rather than relying on documentation, which can be faked, they have the scientific backing of a DNA system introduced in 2009. Ensuring a premium product increases the cost but, as the Australian market is highly competitive, it is not a cost Simmonds Lumber feel they can pass on to their customers. The company at the forefront of this DNA testing is Double Helix Tracking Technologies, based in Singapore. Jonathan Geach explains how the testing is a complex technical feat which enables the genetic maps to pinpoint where trees originated. It involves scraping a small amount of wood off a piece of furniture or a floor. "We then soak it in a number of different chemicals, send it through some centrifuges, and use different types of chemicals called primers to draw out and isolate the DNA," he enthuses. He says that getting DNA out of a tree in your garden is relatively straightforward because the tree in your garden is alive. "However, the oak table in your kitchen or the wooden floor is dead. It's been dead for a very long time. After it died, it was kiln-dried and desiccated," he says. "Getting DNA out of samples like that is rather like getting DNA out of a woolly mammoth that has been in the Siberian tundra for 40,000 years," he says. He likens trees to people: "Trees in the natural setting reproduce sexually. They are therefore genetically individual but, unlike people, they don't move around quite so much. "If we are looking at a certain oak species that is prevalent across Britain, France and Germany, you're going to find the same species, but you're going to find different aunties, uncles and cousins in Central France, and different ones in Germany," he explains. However, a lot of questions can be answered without the necessity of any genetic map. "America is an exporter of sawn timber, or round logs, which are then processed in other countries," he says. "The finished product is then re-exported to Europe or back to America, where they declare the country of harvest as being the US." But anecdotal data suggests that a lot more American oak returns to America than ever left in the first place. "When you start to look at the genetics of this furniture, decking or flooring, you might find an oak species which is common in Russia, for example - an oak species which does not come from America," he says. "Therefore, somebody is either making a mistake or they are deliberately misleading an importer."